Yes, that's right, this isn't just another Friday in September, today is September 10th, and that means it is the sixty-fifth anniversary of the beheading of Mike the chicken. I thought it was enough to mark the day with a headless hencake, but apparently there is an actual festival in Mike's honor: "Attending this fun, family event is a No Brainer!" At first I was kind of appalled about the whole festival thing, but now I am starting to wonder about next year. I shouldn't judge without checking it out at least. Oh, but of course we have Maker Faire to think of. It's a shame when opportunities on the social calendar conflict. Making something of very little is a specialty of mine, so it's not too surprising that I got up to make pancakes on a busy school morning. Nota buena: I was updating the calendar to reflect all the different school holidays, and I made a happy discovery: William and Alex will have Groundhog Eve off, so they can help me prepare for next year's Groundhog Day observations. It is these holidays and traditions that make our lives richer, worthwhile. Life is beautiful. And more! Good news abounds. Peace is restored! 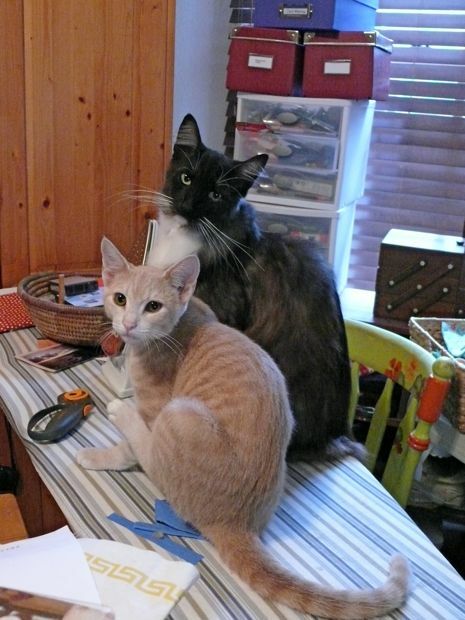 Ferris and Benjamin are loving tolerating each other. I caught them napping side by side on the ironing board. Of course they sat up when I dragged my camera out. Look at Benji's sweet face. He is the very picture of brotherly love. Ferris eats anything. Just saying. Watermelon. Cheese, he loves cheese. And this morning he was macking-out on a piece of asparagus. He was eating it so enthusiastically, and with such satisfaction, that I thought: "No one loves asparagus that much. I don't love asparagus that much." And I do love asparagus, but Ferris ate the whole piece and looked euphoric, like a foodie. No one loves asparagus like our kitty. Steamed, no butter... he probably would have loved it even better with cheese. You did not have to read to the end of this post. You were probably a bit turned off right from the start. 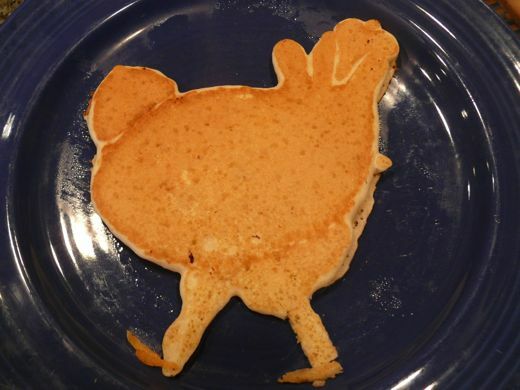 Headless chcken CHICKEN pancake and all. And now you are at the end, and maybe thinking, "What was that all about?" Thank you for reading Chcikenblog, for commenting. I cannot help myself, and I love your company. I am soooooo glad you do what you do: you love your family, you make every day special, you celebrate small things, you value beauty and friendships and living things, and you make me laugh like nobody's business. I wish you lived next door, but since you don't, I'm very glad you share yourself through your blog. Thank you! What was that all about??? Amy, you have me rethinking my whole purpose in life. Love you. Miriam, you are an angel. We would be the happiest neighbors! Hahaaahaaaaa I love this post, and actually your last post as well. It reminded me that I have recently rediscovered that my dining room table is in fact made of wood, it's been so long since I've seen it that I'd completely forgotten! I love your randomness. It keeps me coming back all the time! I love it when kitties finally become somewhat friends. 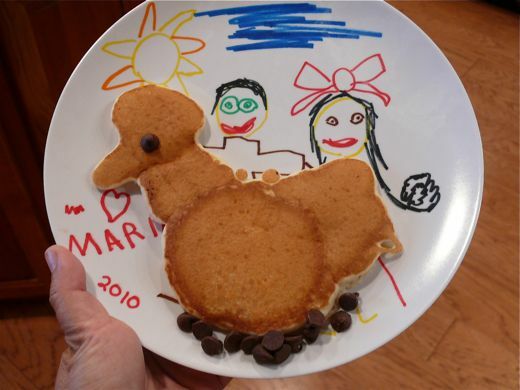 And headless pancake (hencake)... CUTE! Ferris and Benjamin! The two of you are so good to let your mom take your picture together!! Asparagus? Hmmm!! Ferris! You are funny! ... and cute too!! Oh, I envy your access to the Maker Faire! They used to do one in Austin, but alas, no longer. A foodie kitty? Perfect! So glad the cats are getting along better. From The Stash :: What Do You Think?